Ontario WSIB approved Standard first aid training in Hamilton teaches participants effective CPR and AED rescue techniques. The best first aid training in Hamilton, Ontario can be found with Hamilton First Aid. Learn from experienced, knowledgeable and friendly workplace and academic approved instructors in well maintained, clean and conveniently located classrooms. Course prices are the most competitive in Hamilton. Participants may register for a variety of basic courses including standard, childcare and emergency first aid. Visit the Hamilton First Aid website for more information about available courses, dates, times and registration. Stand-alone CPR courses are also available and are divided into three different levels: “A”, “C” and “HCP”. Automated external defibrillator training is included in every first aid and CPR course. Participants that complete the programs are awarded Ontario WSIB approved certificates that are valid across Canada for 3 years. Standards for first aid and CPR are provided through the International Liaison Committee Resuscitation (ILCOR) which ensures that you receive the most effective standards in rescue training. Learn to save a life and strengthen you resume by enrolling in first aid training in Hamilton, Ontario. CSR’s are available during regular business hours to help with question and / or registration. These and many more topics are covered with hands-on training and knowledge components. The requirements a student needs to fulfil in order to pass the program are: 100% attendance, skill demonstration, 75% minimum grade on the written exam. 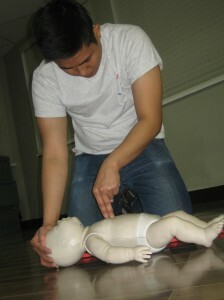 Emergency first aid courses are popular one day programs that also include CPR and AED training. This course covers basic emergencies such as breathing and circulatory emergencies. Students can also sign up for special CPR-only programs. There are three types of CPR classes: A, C, and HCP. All of the levels teach students how to use automated external defibrillators (AEDs). Those are machines that supply the heart with shock during a serious cardiac event (ex: tachycardia). After completing all requirements, students receive a 3-year Ontario WSIB certificate. Before the card expires, students are required to take recertification classes that last 6-8 hours in total. Standard first aid recertification includes CPR level C recertification. Participants with expired certificates must re-take the original course. Hamilton First Aid allows students to settle the total course fees before they start training so there are no problems with additional expenses. The total fees include tuition, taxes, certificates (and registration with the St Mark James), and manuals. Having completely settled the fees allows students to focused completely on training. Full reimbursements are given to trainees who drop out and are unable to finish the program as long as a 3-day notice is given beforehand.